Solacity - Canadian Green Power Goods & Great Advice! Tired of paying Hydro bills? know before building your system! Everything you need for a small off-grid system! We have the right high-quality, deep-cycle batteries for your project! Flooded, AGM, GEL. The grass is always greener at Solacity! We have all you need to create your own beautiful wildflower meadow! Mono- or Poly-crystalline, we have the perfect PV module for you! We can help you design your entire system! Browse through our huge selection of charge controllers! • Reliable PWM and MPPT models! Browse through our informative "Learning" library! Output power of up to 8 kW! Stackable up to 10 units for 80 kW of output power! 120 and 230 VDC models! Both off-grid and grid-tie functionality! Keep your lights on when the grid goes down! • Less Mowing! Less Watering! Less Fertilizing! • Save time, money & the environment with Eco-Lawn! Solacity – Canada’s Solar Specialists! Great pricing on solar supplies and other renewable energy goods; solar panels, inverters, batteries, charge controllers, racking etc. We can also help you design your system and give useful installation advice! Solacity Inc. is a Canadian distributor and retailer of renewable energy products and other green goods based in the Kemptville (North Grenville) area, just a short drive south of Ottawa, in Ontario. Since 2006 we have been helping our customers in all corners of Canada (and some in the rest of the world as well) to become a little more green: We supply wholesale to solar PV installers and large projects, retail goods to customers that want to do a DIY solar installation, and if you need renewable energy advice, or design services please do not hesitate to contact us, we are here to help you. More than an online Web store, Solacity has an actual brick-and-mortar storefront (or straw-bale in our case). We have real people too, and you are most welcome to come and visit us to discuss your solar or other renewable energy project! Need Green Energy Supplies? We Have Them! Solar panels for a Net-Metering grid-tie system, batteries & charge controllers for an off-grid residence or cottage: We have it all! Need help designing your PV system? Ask Us! We have years of design and installation experience in grid-tie and off-grid solar PV systems. Rooftops, cottages, even solar panels on boats, we can help! Have questions about code-compliance? Just ask and we will likely know the answer. We even go back a long way in wind energy systems; wind turbines, wind inverters, and MPPT tables for those. In short, do not hesitate to contact us, we are here to help you make your project a success! Be sure to check out our learning section for a collection of in-depth articles. Solacity does not just talk-the-talk, we actually walk-the-walk: Come visit our 9,000 square feet super-efficient straw-bale office & warehouse in Kemptville, North Grenville! Although the previous Solacity SIP Barn served us well, the business had outgrown that space, and in 2013 – 2014 we built our new Kemptville office and warehouse to serve as the future headquarters for Solacity. Sustainable energy is not just a business for us, we’ve been living and breathing renewable energy because we know it’s the right direction to take. The building is all-electrical, no fossil fuels, with net-zero-plus potential (once the rooftop solar is in place we will produce about twice as much energy as we use, including heating). Some features include, passive solar, day-lighting (natural light) through light-shelves (seen by the position of the awnings). 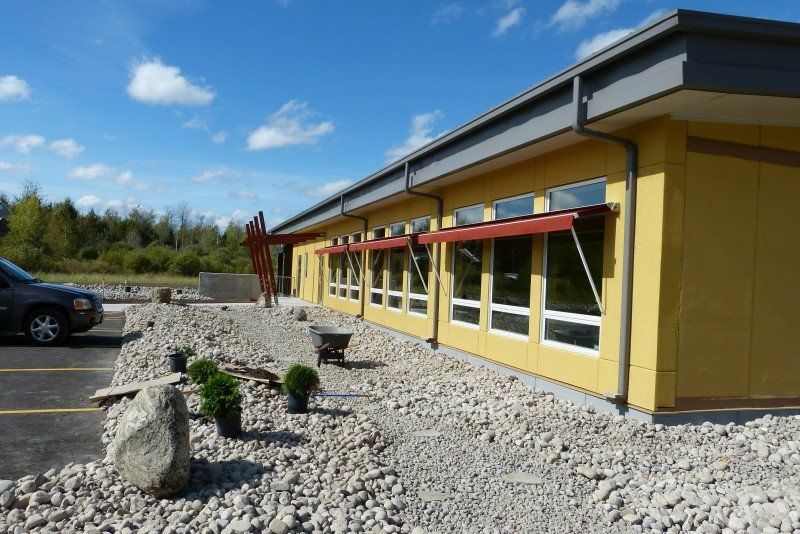 We have strawbale walls with insulation values well beyond the industry standard, geothermal heat-pump with in-floor hydronic heating, passive solar for the office, with triple-pane glazing, and energy-efficient T5-HE lighting. Oh, and what is a sustainable design without a perfect 180 degree azimuth roof, specifically designed for our 100 kW FIT project! Rock-solid charge controllers & more! The very best deep-cycle batteries! Period. Grid-tie inverters since 60 years! Founded 1945, great grid-tie inverters! Very nice adjustable ground-mount racks!